If you are living in Serpong/ BSD area, and you're happened to have a cash-strapped wallet, then you should try the Jo's Kitchen. Located at the Food Court area of ITC-BSD, they offered array of home made dishes with unbelievable price. 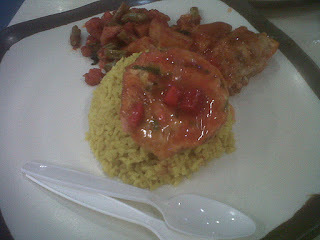 For example, for dish package consisted of rice (you can choose between white rice or nasi kuning), chicken, and one type of vegetable dish, they charged you with the price of Rp 8.900 (US$ 1). You can even choose the egg package (rice+egg+vegetable dishes) for a mere Rp 6.900 (US$ 0.77). They also serves other packages which price more premium (Rp 15.000/ US$ 1.67) but still very much affordable. And the taste is surprisingly good. Just like home cooking.